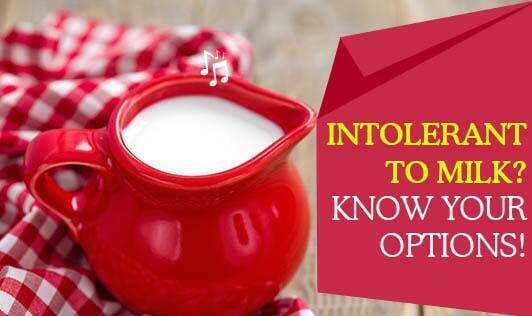 Intolerant to Milk? Know your Options! Milk contains a natural form of sugar called lactose. Inability of our body to digest this sugar is known as ‘Lactose Intolerance'. It is a fairly common condition, so if you are facing the same, stop worrying. Yes, milk is a very good source of many nutrients like energy, protein, calcium, etc. But we can get all these nutrients from many other foods. • People with lactose intolerance many times can tolerate small amounts of milk and milk products at a time, especially if taken with meals. • Choose lactose free formulas for infants with lactose intolerance. • Check the labels before buying any packaged foods. • The ingredient list of the packaged foods should not contain milk solids, milk powder, whey, and curd. • Go for soy milk as a replacement to cow's or buffalo's milk. • To have good amount of protein go for soy, dals, sprouts, eggs, lean cuts of chicken, fish, and nuts. • Get your calcium dose from foods like ragi, leafy vegetables, nuts, soy products, garden cress seeds. If you don't want to miss out on the mighty nutrients which are present in milk, make sure you have a well balanced diet with a variety of healthy foods!